This week I decided to make a sassy sweatshirt out of puffy paint. It took me a while to decide which quote I wanted to put on this shirt. I got it down to two phrases “I’m a scientist. What’s your superpower,” or “Screw ‘Lab Safety’ I want superpowers.” I decided on using the latter one, because I found it very appropriate. It seems that a lot of superheroes get their superpowers from an experiment going wrong. Like the Hulk, Spiderman, Dr. Manhatten, etc. Also, I work in a research lab and one of big rules is to keep your safety glasses and gloves on. If you don’t wear your lab safety gear in my lab there’s a good chance that if an experiment went array, you could use your hand or worst, your eyes. I found this to be a fun project to do while I stressed out for next weeks finals. Time: It took me about 2 hours of drawing and such, and another 4 hours to let it all dry. Step 1: Draw it out. I decided to write this in my own hand instead of using a template. I used the crayon to trace out what I wanted on the sweater. Step 2: Trace it out. 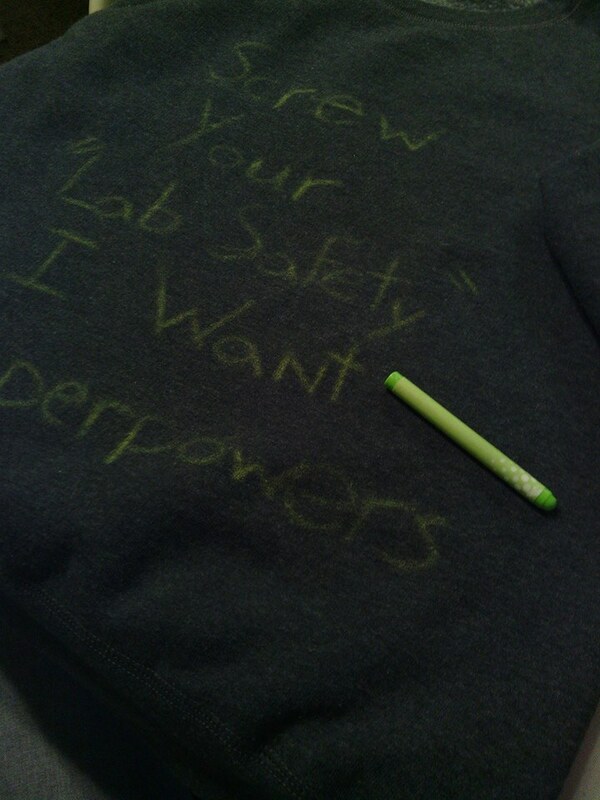 Now, I used the puffy paint to write out and color my sweater. I used the paintbrush to smooth out the puffy paint. This is the end product. Patience is important. There were a couple of times while doing this craft that I got excited and went too quickly on putting the puffy paint on it. What sassy/quirky phrase would fit your daily life?